There comes a time in one’s life when you feel like you need a little more oomph. Another cup of coffee to get you up in the morning. An additional 15 minutes, perhaps, on the treadmill. A little more girl time to help you detox from a stressful workweek. Thankfully, stronger doesn’t have to mean heavier or more expensive. Leave it to J. 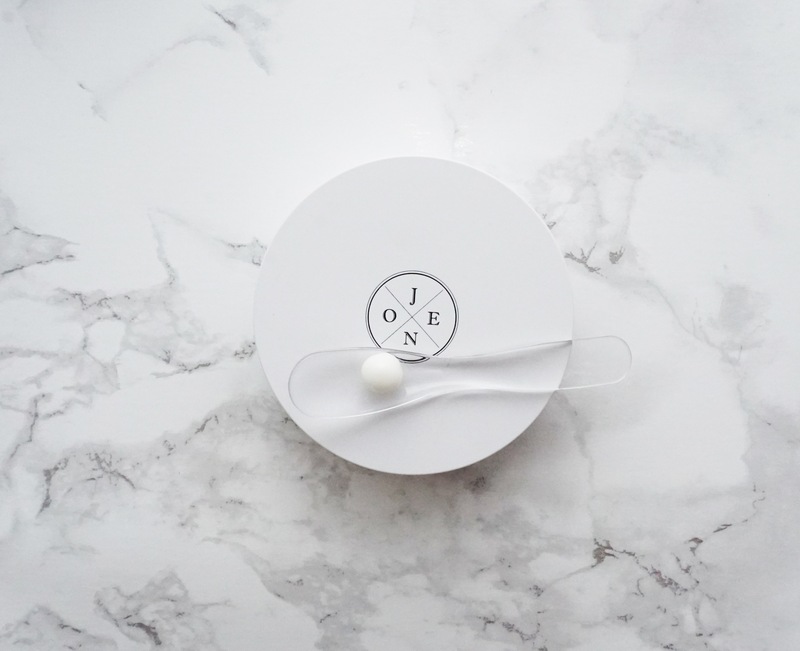 One — the skin care brand by K-drama actor Ha Jiwon — to come out with a face cream that is as genius as its sister “corset mask” Jelly Pack. 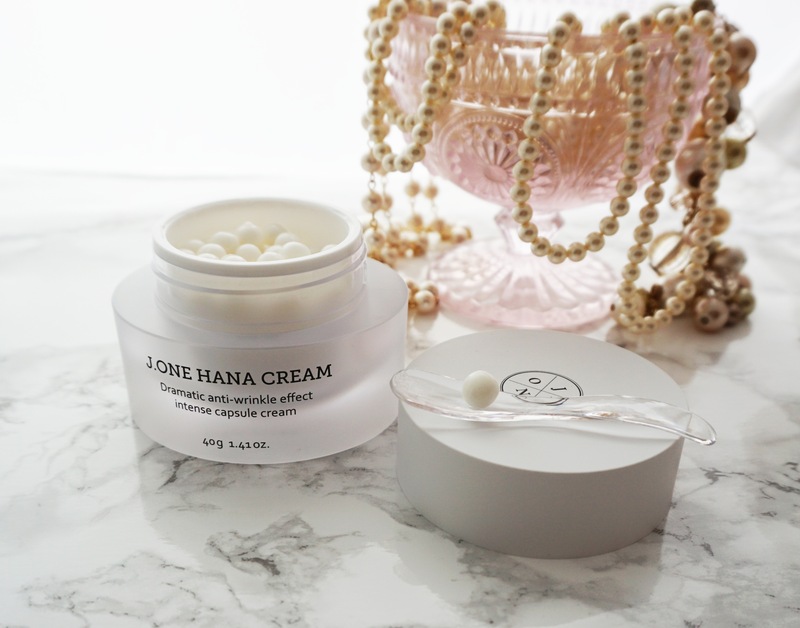 And don’t be fooled: While the Hana Cream may look like a tub of fun, with its pearl-like capsules piled high like treasure in a chest, it’s some serious stuff. The first thing I notice is the distinct scent — rich and flowery, which fades in a bit after application. Since there are no synthetic dyes or fragrances in this product, I can only presume that the scent is from the Damask rose water, listed high up in the ingredient list. Other than its fragrant qualities, Damask rose water is also an excellent antioxidant, long used throughout history for medicinal purposes. The cream features other plant extracts and floral waters, like fermented black tea and water lily, which have antioxidant and even anti-inflammatory effects, the latter the root (no pun intended) cause of many a premature aging woe. Niacinamide and sea daffodil extract work by inhibiting a step in the melanin transfer process, helping to minimize hyperpigmentation. 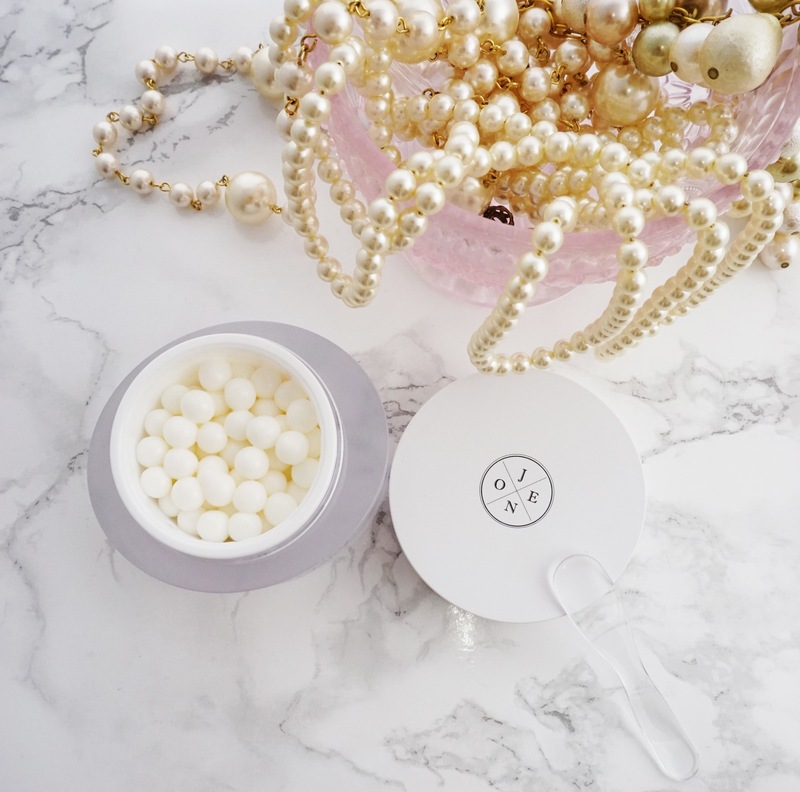 And of course, the star ingredient in the cream is the Nobel Prize-winning fullerene, an antioxidant and “sponge” through which other actives are driven deeper into the skin. What I really love about this cream is the fact that the capsules decrease the likelihood of contamination. Many experts bemoan the dipping and re-dipping of fingers into a tub of cream, increasing the chances of bacterial contamination. While a dedicated spatula helps in this regard, a spatula and a separate, self-contained capsule further keeps everything kosher. As I delicately scoop a capsule onto the spatula, I feel like I’m extracting a pearl from an oyster, adding a sense of “preciousness” to my routine. The capsule is wet, which is a surprise (for some reason, I was picturing a dry ball), and fairly firm with some bounce, though it’s not difficult to crush. (It is a bit slippery, so be careful not to drop it.) Place the capsule on the fingers of one hand and crush with the fingers of the other hand, emulsifying the cream in a circular motion. Once emulsified, the capsule takes on the consistency of smooth cottage cheese or frosting. It’s quite rich and dense, luxurious even. It goes on smoothly, and as I pat it in, it absorbs fairly quickly, considering how rich the cream is. Instantly, my fine lines look blurred, and I’m left with a finish akin to velvet. Really, there’s no other way to describe it — it’s velvety, not slick or shiny, but firmed, plumped, softened, like a really good filter. On subsequent applications, I notice that the scent is softer, with a hint of something warm, like mild vanilla or perhaps even baby powder. I actually really enjoy the fragrance, and as I apply and pat on my face, I close my eyes so that I can inhale it in. This is unusual for me because I’ve used fragranced skincare products in the past, but never have I really noticed or cared much about the scent. But something about this scent is really soothing and relaxing, and I find myself sniffing the tub over and over to figure out why I thought the scent was so perfume-y at first. Frankly, I’m mystified. But it doesn’t matter. Because by now, I’m in love with this cream. It definitely feels like something for someone with aging or dry skin or someone who just needs more oomph in their moisturizer (read: me). After five days of application, I actually look forward to applying the Hana Cream, rather than rushing through my morning routine. 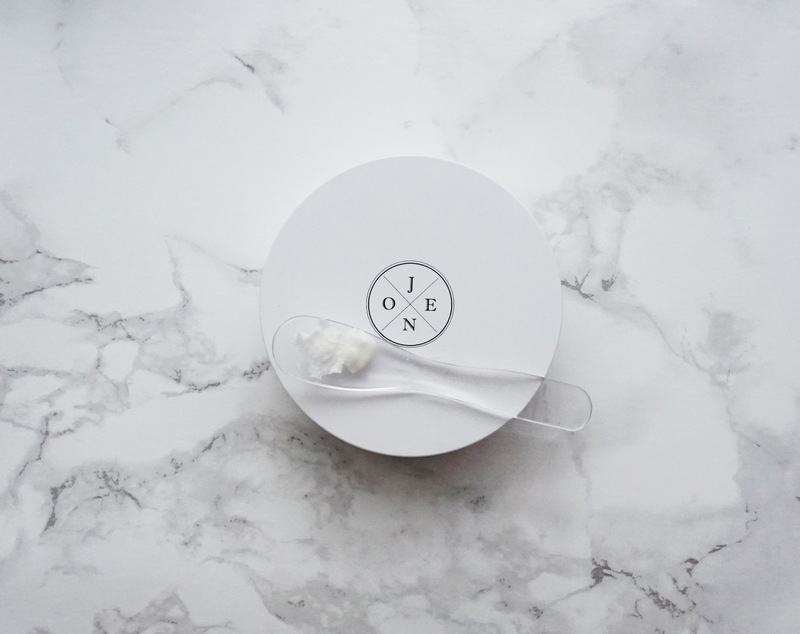 Everything about the experience — the chic, minimal tub; the pearl-like capsules; the luxurious scent; the velvety finish. Between the J. One Jelly Pack (my go-to when I need to look extra good) and this Hana Cream, you can call me officially obsessed. Any chance Ha Jiwon’s going to put out a sheet mask anytime soon? Because then that’d be the trifecta of oomph.